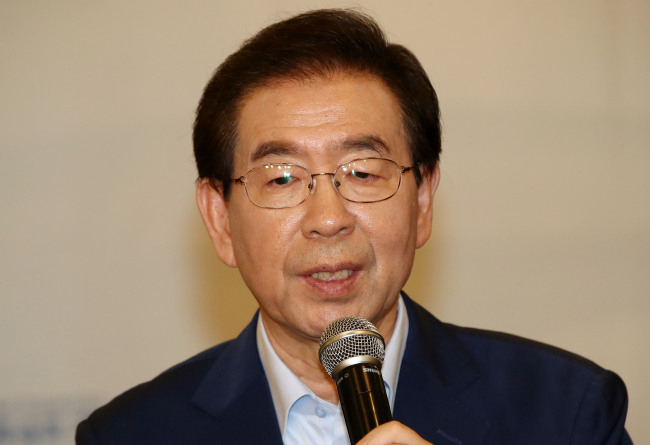 Seoul Mayor Park Won-soon on Monday called for additional and thorough epidemiological investigation into South Korea’s first case in three years of Middle East Respiratory Syndrome, confirmed Saturday. Park said it was possible that the patient may have been aware of his condition before diagnosis and withheld information from authorities. According to the Health Ministry, the 61-year-old man was officially diagnosed Saturday, a day after he returned from a trip to Kuwait via a connecting flight from Dubai. The Seoul Metropolitan Government said on Monday that the patient had advised his wife before his arrival in Incheon to wear a mask upon meeting him at the airport. The city government also found that, although the patient’s wife had driven to the airport, he immediately chose to rush to the Samsung Medical Center’s emergency room in a taxi. His wife drove separately to the hospital. “The patient also said he used the toilet only twice while onboard, but I think it’s possible (that he may have lied),” the mayor said, suggesting that the patient may have put other passengers at risk. On Sunday, the mayor had urged for all passengers on the two flights taken by the MERS patient to be tested and monitored. It is estimated that some 400 people were onboard the two planes -- Emirates EK 860 from Kuwait to Dubai, and Emirates EK 322 from Dubai to Incheon. The mayor also revealed that, contrary to the Health Ministry announcement the day before, the patient had visited local medical clinics twice during his stay in Kuwait and had postponed his return trip to Korea from Sept. 4 to Friday, being too ill to travel. The Korea Centers for Disease and Control, a Health Ministry agency, had previously announced that the patient visited a local hospital only once while in Kuwait. Since the patient’s official diagnosis, two Korean nationals currently staying in Kuwait have been tested for MERS at a hospital there. Both were released after the tests came out negative. A British national who traveled from Dubai to Incheon on the same flight as the Korean MERS patient was also tested for MERS after experiencing fever while under quarantine at an isolation ward within the National Medical Center in central Seoul. She also tested negative. Some 20 individuals believed to have been in close contact with the patient -- including flight attendants, medical doctors and airport employees -- have been quarantined and are not allowed to leave the country until further notice. Airport officials and the Health Ministry have drawn flak after it was revealed that the man was not quarantined at the airport upon his arrival on Friday, although he told officers that he had experienced diarrhea, one of the major symptoms of MERS, for about 10 days while overseas. 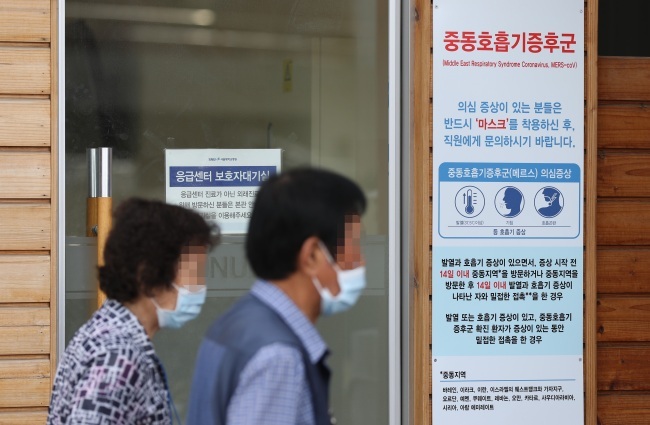 Asked why the patient was not quarantined at the airport, health authorities said that no MERS cases had been reported in Kuwait since 2016, and that he had no symptoms other than diarrhea when he arrived at Incheon. “If we don’t deal with this thoroughly now, a disastrous situation, like the one that took place in 2015, may happen again,” the mayor said Sunday. The Korea Centers for Disease and Control, on the other hand, called it “deeply regrettable” that the mayor had shared so much of the patient’s personal information without first consulting with the central government. MERS swept South Korea in 2015, infecting 186 and claiming 38 lives. The outbreak dramatically affected the everyday lives of Koreans at the time, as it sparked a public health scare and dampened consumer spending. Almost 3,000 schools nationwide were shut down in June that year, while more than 124,000 foreign tourists, mostly from China, canceled their trips to Korea in the same month. Typical MERS symptoms include fever, coughing, shortness of breath and diarrhea. A total of 791 MERS-associated deaths have been reported worldwide since the syndrome was first identified in Saudi Arabia in 2012. Approximately 35 percent of reported patients with MERS have died. No specific treatment or vaccine is currently available for MERS. Treatment is only supportive and based on the patient’s clinical condition.